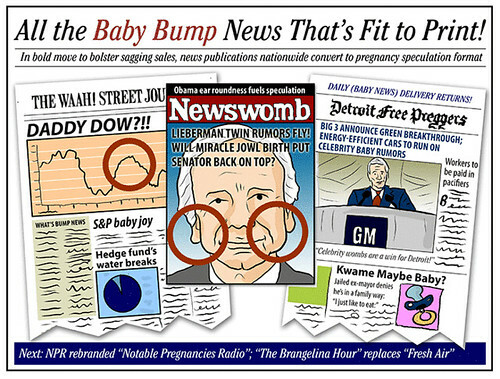 Boiling Point Blog: Feminist, LGBT and progressive political cartoons: Toon: All the Baby Bump News That’s Fit to Print! Toon: All the Baby Bump News That’s Fit to Print! If this cartoon makes no sense to you, then you have blissfully managed to avoid passing within 50 feet of any magazine rack selling celebrity gossip rags. By the way, the WSJ is actually one of the few papers that is doing quite well, I just put in in here because I wanted to make a joke about a pregnant stock index. But the Detroit Free Press actually is in major trouble, if you haven't heard--they actually stopped delivering the print paper most days of the week. In retrospect, I should have squeezed the NYTimes in here--they just had to take a $250 million loan to stay in business. Newspapers everywhere (the ones that still remain, anyway) have been taking all kinds of drastic measures to stay afloat, including jumping on some disturbing trends--like eliminating all their comics and editorial cartoons! So this really isn't all that far-fetched. I'm so NOT in a recession-proof industry. Finally, how sick are you of the phrases "Baby Bump," "Baby Joy" and "Celebrity Baby Boom?" Seattle Post-Intelligencer is up for sale and close down for good if nobody buys it. I hope David Horsey has plans. Toon: New Year’s Resolutions For Our New Economy! Toon: Rick Warren is a CUTER Kind of HATER!